The default method for drawing circular arcs is to specify three points: the start point, a second point and the endpoint. Other methods to draw arcs can be found in the Arc submenu of the Draw menu and in the Arcs toolbar. Click the Arc tool button ( ) on the Draw toolbar. Type arc in the command bar, then press Enter. Type A in the command bar, then press Enter. 3. Specify the second point of the arc. 4. Specify the end point of the arc. The properties of the arc display in the Properties bar. 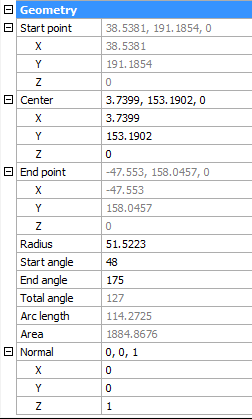 Type a new value in the Center , Radius , Start angle or End angle , then press Enter. Press the Esc key to stop editing the arc.